Get out of my dreams and get into my Sidecar! This upcoming SXSW you’ll find Sidecar all over Austin, TX including at our Twilio SXSW Get.Down event. Party goers will be able to grab free rides to and from the event so you can cruise like an Austin local, with an Austin local. SXSW is one of our favorite events of the year: visiting old friends, spending time with our incredible community and making new friends along the way. This year we’re inviting you to join us for an afternoon of great company, beer, food and ending the day with a special acoustic performance from Akron/Family. How do you register for this event? We put together a little bit of a challenge to register for this year’s event – simply text (512) 861-8833 and follow the instructions. If you succeed, you’ll receive a link and password for the event. It takes some skills of a developer, some skills of telephony history buff and some skills of a true Twilion, but we think you’ll have no problem at all. Launch Festival is one of the top events for entrepreneurial events for tech founders, featuring incredible content around launching your startup, raising money and figuring out how to start your company. Companies in the demo pit compete to present on stage for a chance to grab funding – and we’ve seen some stellar startups launch from this event. Launch kicks off March 4 – 6th in San Francisco and we have 25 tickets to give away. Dial +1 415-728-0417 , the first 25 folks to call and answer the Launch trivia question correctly will receive a complimentary ticket to this conference. Codecademy wants to help anyone learn how to code, so people at least have a basic understanding of programming. Last January the team declared 2012 “Code Year”, challenging anyone and everyone to learn programming skills. Over 450,000 people joined, including NYC Mayor Michael Bloomberg. Now in 2013, the team is expanding with new curriculums, including APIs, that further empower the newly-skilled developer. We are incredibly excited to be one of many great APIs launching lessons with Codecademy. Alongside Bit.ly, NPR, Parse, Placekitten, SendGrid, SoundCloud, Stripe, Sunlight Labs and YouTube, the Codecademy community can start hacking their phones with intro lessons to Twilio SMS and Twilio Voice. Read more about the new API lessons on the Codecademy blog. 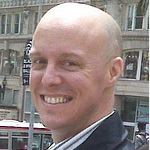 Clint Wilson is the CTO of Cazoomi, provider of integrated solutions for CRM, ERP and cloud applications. Recently Cazoomi released a great add-on for the business software suite NetSuite that allows you to easily integrate Twilio into your email campaigns with MailChimp. Clint tells us more about it in his guest post below, read more about the app here. What is NetSuite Call Tracking, Anyway? Do you have to manage multiple online marketing campaigns internally, or are you trying to track both online conversions and phone call conversions? At Cazoomi, our customers wanted to track phone conversions in their CRM, but struggled to find a solution. So we sought to create a NetSuite add-on that makes it easy to create email campaigns with call tracking enabled phone numbers. This guest post is by Patrick Stonelake, Director of Innovations at Fruition Partners, a cloud integration services provider focused on IT Service Management. Patrick is here to introduce a new product that allows for simple integration of Twilio with the cloud-based enterprise IT Service Management platform ServiceNow. Join Fruition Partners CEO Marc Talluto and Twilio CEO Jeff Lawson, along with Forrester Research Principal Analyst Eveline Oehrlich as we discuss what’s next for IT service management and how cloud-based tools are transforming IT. Free Webinar this Thursday, December 13th. From sharing our favorite emojis to reaching millions in just one text message, SMS is something we couldn’t imagine communications without. Today we’re celebrating the 20th anniversary of one of communications’ defining mediums. Below is the history of the SMS, as told by Twilio. Alexis Finch takes notes differently than most: she sketches her way through presentations and interprets it visually on paper. Last year she shared two great Sketchnotes from TwilioCon 2011 talks including Oren Jacobs of Pixar and Adrian McDermott of Zendesk. 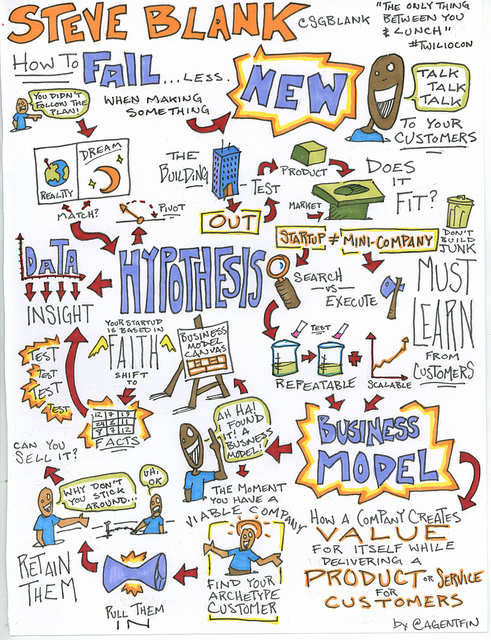 Lucky for us, Alexis attended TwilioCon 2012 and captured keynote speaker Steve Blank in a rad new Sketchnote. Steve Blank is the author of The Startup Owner’s Manual and 12 Steps to the Epiphany. He gave an inspiring presentation about how you can build a company step by step, and fail less. See Alexis’ Sketchnotes below and be sure to take a look at other Sketchnotes from TwilioCon 2012 like the Connecting with Customers and RealTime Panel, and Dave McClure and Naval Ravikant’s Fireside Chat on Flickr. You built a beautiful and engaging mobile app, now how do you get people to use it? More importantly, how do you get people to share it with their friends? Sylvain Gauchet, Co-Founder of the app marketing powerhouse Apptamin, explores why mobile app distribution is valuable and provides a great tutorial on how you can build this for your app. Sylvain founded Apptamin to help developers promote their applications by providing great tools and sharing lessons learned on the blog. Below is a selected piece from Sylvain’s original content, read the full-length post here. Parse is a seriously awesome platform for building mobile apps and we’re teaming up to make it even easier for mobile developers to access the Twilio API through Parse’s Cloud Code. Today Parse introduces the Twilio Cloud Module, one of many upcoming Parse integrations on their new Cloud Modules product, all making it simple to use third party services when building your mobile apps. Mobile developers are using Twilio in incredible ways, like the drawing collab app DrawChat that uses phone number verification to protect its users. Or the social app Path that uses Twilio SMS for mobile app distribution. 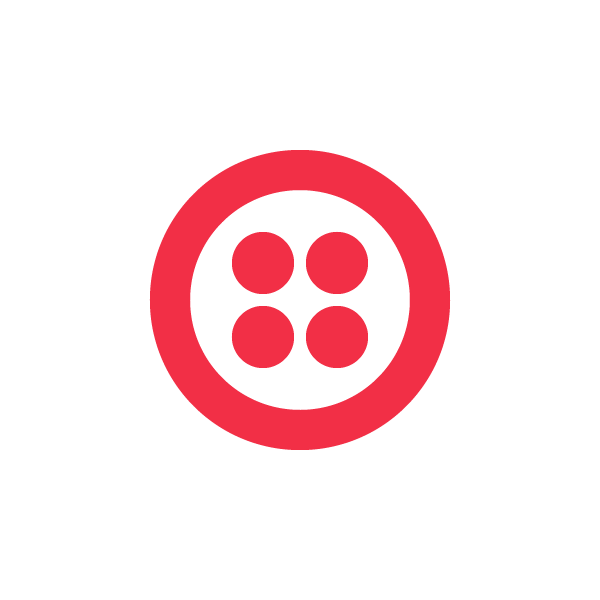 Whatever Twilio feature you want to add to your mobile app, now you can easily integrate within Parse.